Fresh from two consecutive race victories in Silverstone and Misano, the Yamaha Factory Racing Team are now returning to Spain for the third ‘home’ race of the year for defending world champion Jorge Lorenzo, the Gran Premio Iveco de Aragon at the Motorland circuit in Aragon. Lorenzo has yet to take a victory at the track, scoring a third place podium in 2011 and improving to finish second last year. Fresh from his two consecutive race wins, the reigning world champion is aiming to take a third win as he fights to retain his title. Teammate Valentino Rossi has yet to be on podium at Aragon, scoring a highest place finish of sixth in 2010, his last visit to Aragon on a Yamaha. The Italian will be looking to make the most of an improved bike set up following the recent Misano test to claim his first Aragon podium finish. Situated in hills near the town of Alcaniz, Aragon is a relatively new circuit to the calendar having completed construction in time to host its first Grand Prix race in 2010. The Hermann Tilke designed circuit is 5.077km in length with an impressive straight that runs for just under a kilometre. 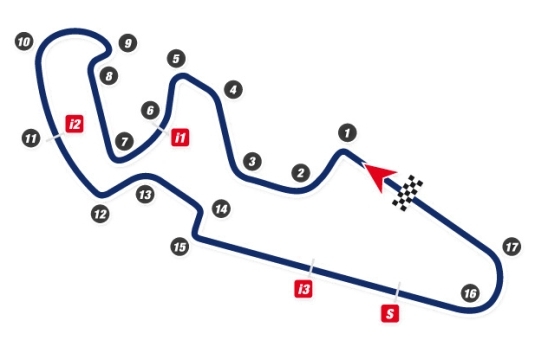 There are plenty of elevation changes through the first series of turns and a wide track for overtaking opportunities.